Maps of Mastery creates poster and cardstock maps scaled for miniature battles. About two-thirds of their maps show space stations and other science-fiction locations. The rest feature natural encounter locations on a 1-inch grid, a perfect stage for fantasy battles in Dungeons & Dragons and similar games. As proven by my map galleries, I collect printed battle maps, so when Maps of Mastery kickstarted new and reprinted maps in their Forsaken Lands series, they tempted me. I tried to remain sensible. At $12 per poster, the price seemed high compared to Paizo’s plastic-coated flip-mats. The pictures looked nice, but many outfits sell poster battlemaps that consist of geometric shapes flooded with coarse patterns. Many look better than I could do, but still appear homemade. After weighing my choices, I ordered 3 posters rather than all 4. I should have purchased them all. The online pictures fail to capture the color and detail of these maps. These Forsaken Lands maps look stunning. The Forest Glade ranks as the best. At 22×34 inches, it offers a feast for the eyes. I love the rays of sun crossing the glade and the mist rising from the waterfall. For encounters call for a smaller venue, the maps feature distinct areas like glade’s waterfall and faerie circle. On your table, you can frame the area in play. Plus, five of the maps join edge to edge to create a 170-inch-long odyssey. I need a bigger table. I love stuff like this. I used to devote hours and hors to hand-drawing colorful maps on gridded presentation paper. Unfortunately, these days I don’t have that kind of time (or desire), but neither do I want to spend the money to get high-grade prints like these. Do you know of any happy mediums? 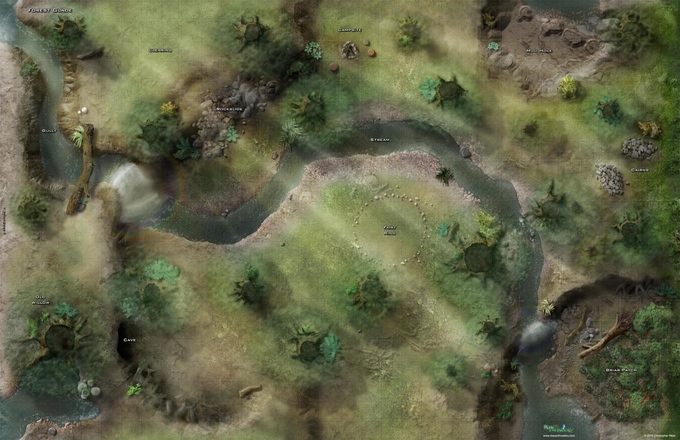 For example, a map generating/map-building website or software that you can print from? I don’t know of any programs like you describe that I can recommend. I would like to find a good one. Can you tell me what these are made out of? I assume paper, but is it thick card stock? Can they be rolled up and transported with vinyl battle mats? The posters are made of paper. They have a quality feel, but lack the weight of card stock.